Monte, devoted husband, father, and exceptional friend to many, died at home in Lynnwood on May 28th, 2011 following an arduous 2 year battle with colon cancer. He maintained his sense of humor, passion for life and continually expressed his gratitude and love for others throughout this difficult time. He was 55 years old. Born in Spokane to Tom and Mathilda Edwards in 1955. Monte was raised in Spokane where he graduated from Shadle Park High School in 1974. He went on to attend Western Washington University in Bellingham where he met his wife Nancy and graduated with a Bachelor of Science degree in Biology. Monte, a 30 year resident of Lynnwood, had a 27 year career as a store manager for Big 5 Sporting Goods in the Puget Sound Area. He was a fantastic dad to his two sons involving himself in leadership roles with the Boy Scouts, managing hockey teams and rarely missed any of the football games, hockey games, swim meets, track meets or performances in which his son’s participated. He loved aviation and was a member of the Flying Heritage Collection. He will be remembered for his fondness for hats, antiques, fossils, clocks, history (especially WWI) the Beatles, formula I car races and Hawaii. 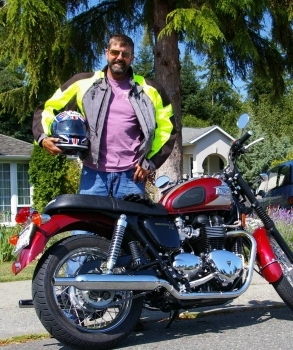 He loved to fish, ride his motorcycle, bicycle, hike, travel and spend time with his family, friends and dogs. A fun-loving man, who treasured his friendships and family – he had a gift for bringing people together. 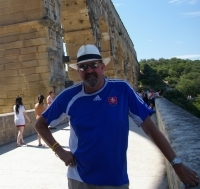 Monte facilitated all kinds of fun events bringing together friends and family such as: ski racing, BBQ’s, pinball tournaments, fishing trips, concerts, hikes and so much more. Many will remember Monte for his great story telling and ability to make others laugh. He is survived by his wife Nancy of 28 years, sons Max and Alex; sister in law, Karen Walsh, brother in law, Dave Eastman (Tanya); mother in law Jean Eastman-Swenson (Carl Swenson); nieces and nephews Nicole Walsh, Sean Walsh, Kayla Eastman and Hallie Eastman. He was preceded in death by his parents Tom and Mathilda Edwards (Spokane). Please use the “View Memorial and Sign Guestbook” link on this page to post comments and remembrances. A Memorial Service will be held at the Edmonds United Methodist Church at 2:00 PM on Friday, June 24, 2011. Click on the link below for a map and driving directions. "Where young adult volunteers learn technical skills, management techniques, aviation history, and other related subjects. For those who show capability, dedication, and interest, we also have a flight training program."